If you are experiencing slow hair growth or an itchy scalp, a sulfur based oil could be the solution to your issue. You will find a wide variety of different sulfur based oils on the market.They vary in price an quality. You want to find a sulfur oil which has been infused in good quality natural oils. The Liquid Gold sulfur based hair growth oil is that high quality sulfur oil. This oil is made of a very fine sulfur and amazing high quality natural oils. What's in the Liquid Gold growth oil? Grape seed oil: This oil is extracted from the seeds of the grapes and is loaded with lots of vitamin E. Grape seed oil treats weak hair, frizzy hair, hair loss and dandruff. The sulfur in this oil blend is very fine, so when you apply it there is no grittiness , as you sometimes find with other sulfur oils. Shake, pour and apply. A proprietary essential oil mix is used to give this blend a pleasant smell. No unpleasant smell from this product. What does sulfur do for the hair? Fungus activity on the scalp causes slow hair growth and baldness. Scalp fungus is one of the top reasons for more hair loss or slow hair growth. Applying a tropical sulfur based oil to your hair 3 times a week will kill fungus activity. Once the scalp fungus is killed your hair starts to grow and thrive as it should and you retain more length. 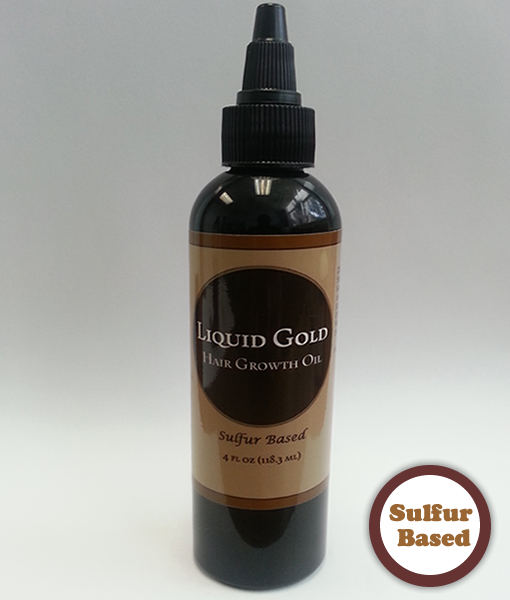 The Liquid Gold sulfur growth oil is the best sulfur based oil you will find on the market. The best price and best quality. You can purchase a 4 ounce bottle for $9.95. If you apply the oil 3 times per week it will last you for one month. You can also purchase the oil in a refill 8 ounce bottle for $16.95. Sulfur oil <<Green Magic Growth Cream>>>Beauty Vites HSN vitamins order below! Give your hair growth a one two punch by combining the sulfur oil with the beauty vites hair skin & nails vitamins. The beauty vites hair vitamins are $14.95 which is a one month supply. Start your hair growth journey today without hurting your wallet. This is the absolute best deal on a hair growth supplement. Combine the product usage with the awesome Coily Queens Regimen for even better results. Get the regimen here! Also check out the Green Magic cream by Liquid Gold. It is a growth cream filled with awesome ingredients. I also use it as a second or third day twist cream. It is non water based so it moisturizes without shrinking the hair. Your twist out turns out defined but with lots of stretch. Green Magic Grow Cream Order below! Vee where can you purchased Liquid Gold International? ?